MQTT uses a TCP/IP connection. This connection is normally left open by the client so that is can send and receive data at any time. 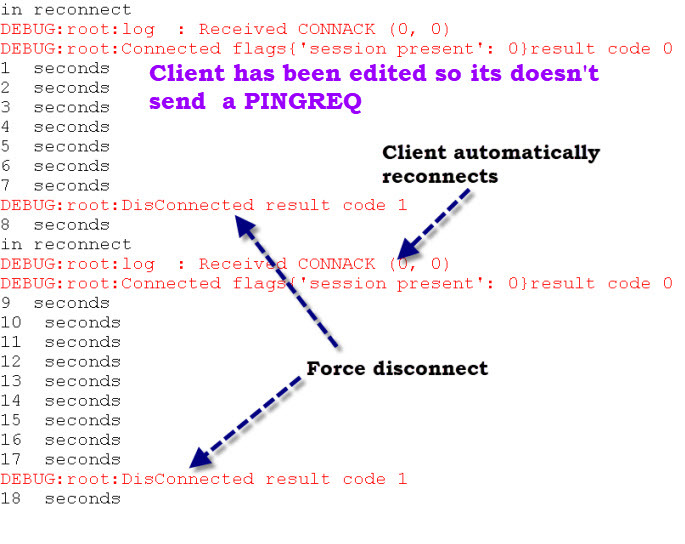 If no data flows over an open connection for a certain time period then the client will generate a PINGREQ and expect to receive a PINGRESP from the broker. This period is known as the keep alive period. The Client can send PINGREQ at any time, irrespective of the Keep Alive value, and use the PINGRESP 535 to determine that the network and the Server are working. The default keep alive period for the Python MQTT client is 60 secs, but it can be set to anything you want when you establish the client connection. Note: When using the Python MQTT client you don’t normally need to generate these ping messages as they are taken care of by the client when you call the loop() function. You can view these ping requests and responses on the server and client. 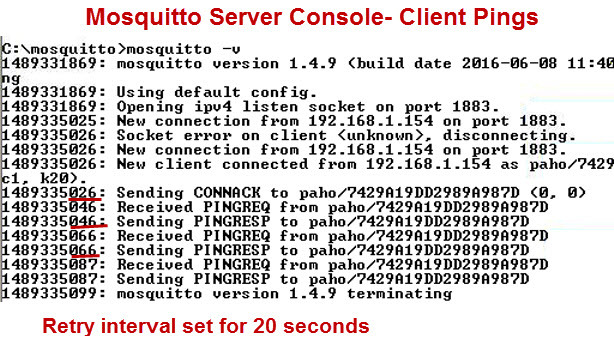 To view on the server start mosquitto with the verbose option or enable logs- see Mosquitto logging and logs. Here is a screen shot of the server console with retry period set to 20 seconds. To view on the client use the on_log callback. 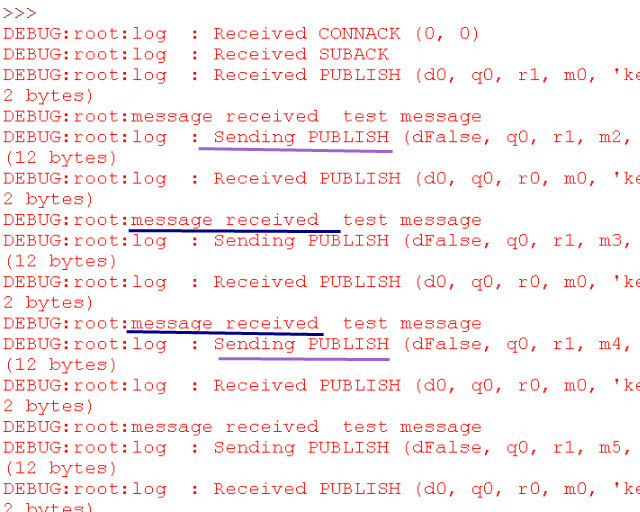 The screen shot below shows the output of a client script that is connected to a broker, but doesn’t send or receive any messages. You can see that the PINGREQ and PINGRESP messages.Here is a screen shot of the client. You may think that sending messages on a regular basis would stop the PING messages but it turns out that the keep alive interval applies to both publish and receive messages. Below is a screen shot with the client publishing at regular intervals( every 5 seconds) but pings are being sent (keep alive is 12 secs). If I modify the test script by subscribing to the same topic so I receive messages, as well as publish messages, you notice that no PINGREQ and PINGRESP are being sent. In the absence of send and receive messages if for some reason the PING requests/responses aren’t successful then the broker will force disconnect the client. I have modified the script to include a simple timer and set the keep alive to 6 seconds. More importantly I have suppressed the PINGREQ message so the broker never sees it. You can see that the server disconnects the client after approx 9 seconds. Q-Can I disable Keep alive messages? Q- Does it make sense to have a very long keep alive period? A- Personally if I was expecting that a client would have very long periods (>15mins) of total inactivity I would disconnect it, and reconnect when It had data to send.. The pingreq/response don’t stop the connection breaking but only detect a broken connection. Are you worried about the keepalive value? “…If for some reason the PING requests/responses aren’t successful then the broker will force disconnect the client.” — you mean AND if other control messages have not been received, right? That is, PINGREQ/PINGRESP messages are sent only in absence of other messages — if PUBLISH messages were regularly sent, there would be no need for PINGs at all. Also: “…. the keep alive interval applies to both publish and receive messages” — Do you mean: The same KeepAlive timer for PING[REQ|RESP] is set after after the client sends a PUBLISH message, after which a PINGREQ is sent? (not sure what you mean by RECEIVE; maybe you mean PUBREL when QoS=2?). Yes correct you only get ping messages if no other messages have been sent and received. 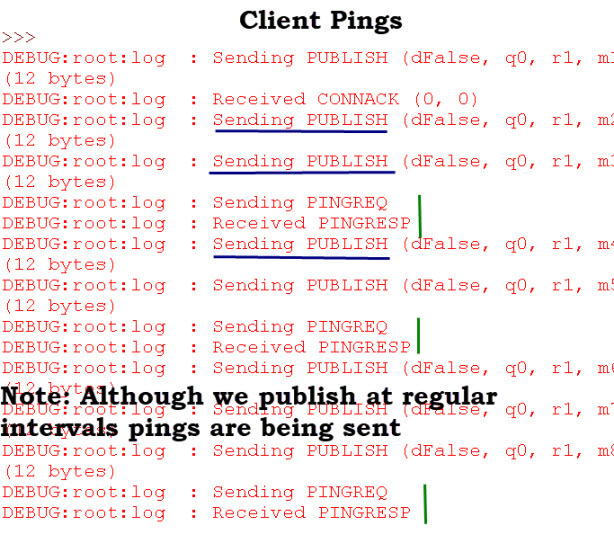 By receive I mean that even if you have a client publishing messages continuously the Ping messages will be sent if the client isn’t receiving messages. Hi, will you going to make a youtube video for this tutorial? Also, can i ask for the test script you used to run this test?